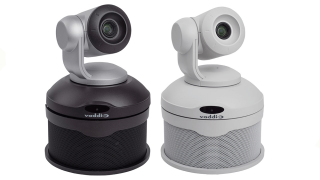 The What: Vaddio will showcase its new ConferenceSHOT AV Enterprise Class Conferencing System at ISE 2017 booth 2-C42. The USB-based system is designed for huddle rooms and small- to medium-sized conference rooms. The What Else: The ConferenceSHOT AV integrates a 10X zoom PTZ camera and audio conferencing mixer into a single USB 3.0 device, for connection of up to two microphones and an external speaker directly to the camera. It allows plug-and-play functionality with all major UCC soft clients such as Skype for Business, WebEx, and Google. For smaller rooms, the ConferenceSHOT AV with a single EasyUSB table MicPOD is ideal; for larger rooms, two EasyUSB MicPOD microphones (table or ceiling) connected with the Vaddio powered loudspeaker provide complete room coverage. The USB 3.0-based ConferenceSHOT AV supports any collaboration application enabling UC soft clients, such as Skype for Business, WebEx, Google, and more, to become a group collaboration application. ConferenceSHOT is UVC compliant, requiring no drivers to be installed. ConferenceSHOT AV incorporates the Vaddio Remote Management system, providing remote monitoring, management, and control of a distributed camera network. IP-accessible and a built-in web server enables both browser control and IP-live preview and setup from PCs, Macs, and mobile devices including iPhone, iPad, and Android devices. The Bottom Line: The ConferenceSHOT AV was designed with corporate, healthcare, government, and education environments in mind—places where USB-based BYOD or dedicated PCs are being used in the conference room. The system supports customized AV designs with third-party equipment or can be deployed as standalone solution.